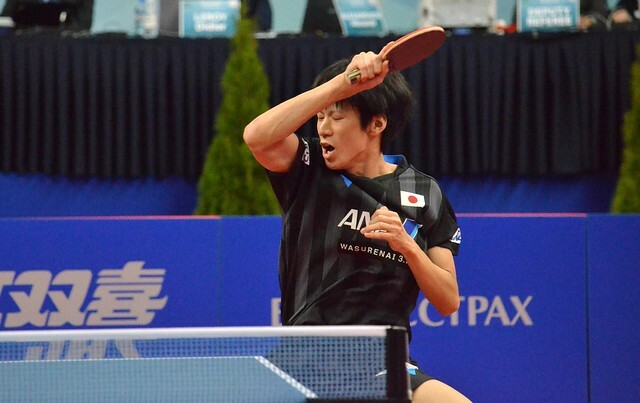 Upsets earlier in the day on Thursday 15th November in the Men’s Singles event at the 2018 ITTF Challenge Belgosstrakh Belarus Open in Minsk but the biggest was reserved to the very end of proceedings. Poland’s Patryk Zatowka, required to qualify, accounted for Russia’s Kirill Skachkov, the no.2 seed (11-8, 16-14, 11-7, 7-11, 4-11, 11-9), a result that to some extent atoned for one year earlier, when at the same stage he had been beaten by Chile’s Felipe Olivares. Success contrary to status for Patryk Zatowka, as the curtain closed it was the same for Japan’s Kakeru Sone, Italy’s Leonardo Mutti and China’s Zhao Zihao, all players who had also been required to compete in the two day qualification tournament. Kakeru Sone beat Frenchman, Andrea Landrieu, the no.17 seed in a closely contested seven games engagement (11-5, 8-11, 8-11, 11-9, 11-3, 6-11, 11-6), in one game less Zhao Zhihao overcame Germany’s Kilian Ort, the no.32 seed (8-11, 10-12, 11-7, 11-8, 11-6, 11-6). Meanwhile, in five games Leonardo Mutti ended the hopes of Denmark’s Tobias Rasmussen, the no.27 seed (15-13, 11-8, 6-11, 11-3, 11-4). Worthy wins and although according to seeding; the win recorded by Japan’s Yukiya Uda, the no.10 seed, was a result to attract the attention. The runner up some three weeks ago at the 2018 ITTF Challenge Belgium Open in De Haan, the 17 year old accounted for Russia’s Alexander Shibaev, the highest rated player in the qualification tournament; moreover judging by his past achievements, a potential tournament winner. Notably on the ITTF World Tour on home soil in Russia in 2013 and two years earlier in Poland he had been the Men’s Singles runner up; furthermore, earlier this year in Montreux he had reached the quarter-final stage of the Europe Top 16 Cup. Most impressively, Yukiya Uda prevailed in five games (8-11, 11-3, 12-10, 11-6, 11-6). A high note to end the day for Japan; it was the same for Belarus, Aliaksandr Khan, the no.5 seed, beat China’s Shen Zhesong (11-8, 13-11, 11-9, 12-10). Play in the second round of the Men’s Singles event will be held on Friday 16th November.